London, 7th September 2011; Wagner Solar UK Ltd (Wagner Solar) receives acknowledgement for its Solar Training School, picking up the Industry Development Category Award for the SOLAR Industry Awards 2011. The Award was presented in Hamburg to coincide with the European Photovoltaic Solar Energy Conference and Exhibition (EU-PVSEC), Europe’s most important event in the PV sector. 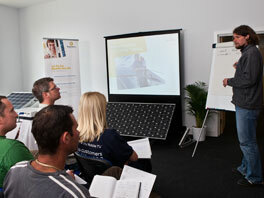 Wagner Solar’s training school is designed to provide advanced training for installers of PV, so is specifically aimed at solar installers who are already MCS accredited. The solar industry is growing at an unprecedented pace and technology is advancing at speeds rarely seen before. PV installers, who are specifying and installing systems for the general public, are the industry’s representation to the end public and thus the backbone of the industry, so it is vital for them to keep up-to-date with ever advancing technology and changes in the industry. Through the Wagner Academy, Wagner Solar is demonstrating a corporate commitment to delivering a better quality and better regarded industry. The Academy operates as a non-profit initiative and places are offered to installers on a first come first served basis.